The band emerged from. a 1950s pop band The Four Fours, formed in Tauranga in 1958 by drummer Trevor Spitz. Lead guitarist Bill Ward joined in 1959, former police cadet Dave Hartstone became rhythm guitarist in 1960, and Frank Hay was enlisted on bass. The foursome rapidly became one of the most sought-after bands in the country. In mid-1966 Maurice Greer, then fronting his own band The Saints, was asked to try out. He had his first group at the age of 14 and was billed as "the teenage wonder drummer". In 1964 he began experimenting with his drum kit, converting it into a stand up-unit, which he claimed was better for his vocals. As well as his drumming ability, the Four Fours were impressed with his ability to harmonise and hit high notes, talents valued by chart-topping bands of the time. He joined just in time to record their biggest hit "Go Go"/"Don’t Print My Memoirs". The band, featuring Maurice Greer as vocalist and stand-up drummer, toured as support band for The Rolling Stones' 1966 New Zealand tour and sailed to the UK in August, changing their name en route to the Human Instinct. The band won a recording deal with Mercury Records in 1967, releasing "Rich Man" (which New Musical Expess described as a "pounding up-tempo piece with ear catching lyrics and some weird sounds"), "Can’t Stop Loving You", and a re-recording of the Four Fours' "Go Go". The band then signed with Deram Records to record "A Day in My Mind's Mind", described 30 years later by English critic Jon Savage as "a blurring of the real and fantastic, aurally reproduced by untuned raga-style guitars and a few voices". Greer declined an offer to join the Jeff Beck Group, opting instead to return to New Zealand in September 1968 as the band disintegrated. Palmerston North-born Greer sought a heavier rock sound with his band’s new three-piece lineup back in New Zealand: he had enlisted guitarist and old high school friend Billy Te Kahika (who used the name Billy TK) and bassist Peter Barton. The Human Instinct secured a role as resident band at Auckland’s Bo Peep Club, then abandoned the gig to return to Britain in February 1969, where they invested in a massive PA and lighting system. They remained there for three months, during which time they met New Zealand guitarist Jesse Harper (real name Doug Jerebine), who was to contribute seven songs to the band’s first three albums. During recording Barton was replaced on bass by Larry Waide. In June 1970 the band began work on their second album, Stoned Guitar, after which Waide was replaced by former Underdogs bassist Neil Edwards. The band began work on their third album, Pins In It, which was released in June 1971. In 1972 Greer changed the lineup again, enlisting guitarists Martin Hope (Fourmyula) and John Donoghue (Timberjack) and bassist Glenn Mikkelson for a new country rock sound. The band released two more albums. A series of lineup changes took place before Greer ended the band in 1982. 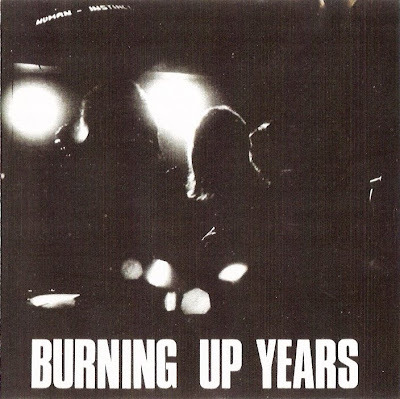 Burning Up Years was the debut album by New Zealand blues-rock band The Human Instinct. It was released in 1969 and reissued on CD by Ascension Records in 2001. The album's title track was a version of a 1969 song by Birmingham progressive rock trio Hard Meat. Hard Meat's original version appeared as the B-side of their cover of The Beatles' "Rain"). Other cover versions on the album were The Kinks' "You Really Got Me", Neil Young's "Everybody Knows This is Nowhere" (listed as "I Think I'll Go Back Home" and wrongly credited to New Zealand-born songwriter/guitarist Jesse Harper) and Ashton, Gardner & Dyke's "Maiden Voyage", wrongly credited to Maurice Greer.